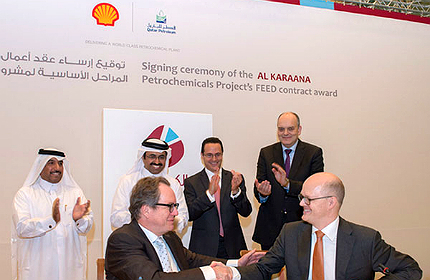 The FEED contract for the Al-Karaana petrochemical complex was awarded to Flour in February 2013. Officials reviewed the positive progress of the project in November 2012. Image courtesy of Qatar Petroleum. 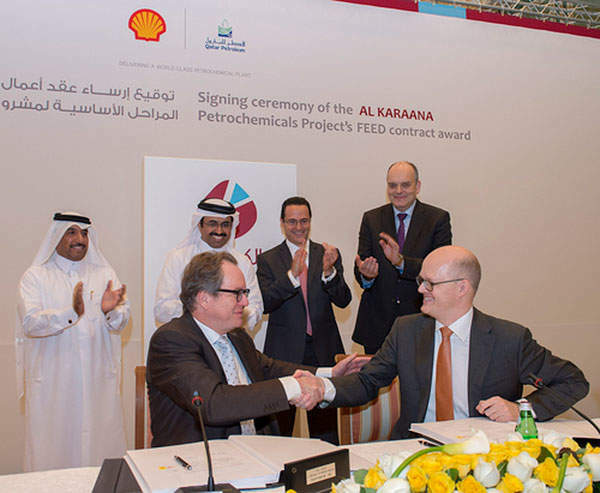 Qatar Petroleum (QP) and Shell agreed to initiate the project definition phase of Front End Engineering and Design (FEED) for the Al-Karaana petrochemicals project in February 2012. Al-Karaana Petrochemical Complex is a proposed olefins and derivatives plant, which will be located at Ras Laffan Industrial City in northern Qatar. The project is being developed by a joint venture (JV) of Qatar Petroleum (BP), which holds an 80% share in the project, and Shell, holding the remaining 20% share. The BP-Shell JV is expected to invest $6.4bn for the construction of the petrochemicals plant. The Front-End Engineering and Design (FEED) works for the complex are being carried out by Fluor. The JV had completed the selection of key technologies for its derivatives processes, even before the announcement of the FEED contractor in February 2013. The new complex is expected to come online in 2018. The main component of the project is the construction of a mono-ethylene glycol (MEG) plant. The contract to develop a basic engineering package (BEP) which covers the FEED work for the MEG plant was awarded to Foster Wheeler’s subsidiary Global Engineering and Construction Group in September 2012. The products from the complex will primarily be targeted for the Asian markets. "The BP-Shell JV is expected to invest $6.4bn for the construction of the petrochemicals plant." The project will comprise of constructing and installing the equipment for a steam cracker, a mono-ethylene glycol (MEG) plant comprising of two trains, a linear alpha olefin (LAO) unit and an oxo alcohols (OXO) unit. The MEG plant will be the largest of its kind in the world when it comes online. MEG is used as an ingredient for polyester fibres and film, polyethylene terephthalate (PET) resins and engine coolants. LAO is used in the manufacturing of plasticisers and detergents. OXO derivatives are used in the automotive, construction, cosmetics and pharmaceutical industries. The MEG plant will use Shell’s OMEGA (Only MEG Advantaged) technology to process ethylene glycol using ethylene as feedstock. The technology incorporates Shell’s EO process with Mitsubishi’s catalytic stand-alone MEG process. "The MEG plant will use Shell’s OMEGA (Only MEG Advantaged) technology to process ethylene glycol." This process involves the oxidation of ethylene to ethylene oxide using dioxygen and silver catalyst, with the inclusion of ethyl chloride as a moderator to avoid over-oxidation. Ethylene oxide is further reacted with carbon dioxide to form ethylene carbonate. Ethylene carbonate is finally hydrolysed to produce monoethylene glycol (MEG). The LOA plant will make use of the Shell Higher Olefins Process (SHOP) technology. The patented SHOP technology basically involves the oligomerisation of ethylene. The OXO derivative unit on the other hand will implement the OXO T-Process technology, which was licensed to the JV by Mitsubushi Chemical Corporation (MCC) in January 2013. The JV plans to acquire the required feedstock for the plants from the neighbouring natural gas projects in the country. Qatar Petroleum (QP), formerly Qatar General Petroleum Corporation, is a state-owned petroleum company and is currently the world’s largest LNG producer. The company carries out all oil and gas related activities in Qatar. The company was founded in 1974 and is headquartered in Doha. Shell is an energy and petrochemical company headquartered in The Hague. The company operates in 90 countries and owns about 44,000 service stations worldwide. The company was founded in 1907 and has more than 90,000 employees. Under the development and production sharing agreement with the government of the state of Qatar, the fully integrated Pearl Gas-to-Liquids (GTL) project is being developed in Ras Laffan, Qatar. The Qatar Helium 2 project will be the world’s largest helium refining facility in Ras Laffan Industrial City, Qatar. The $500m project broke ground in May 2010.